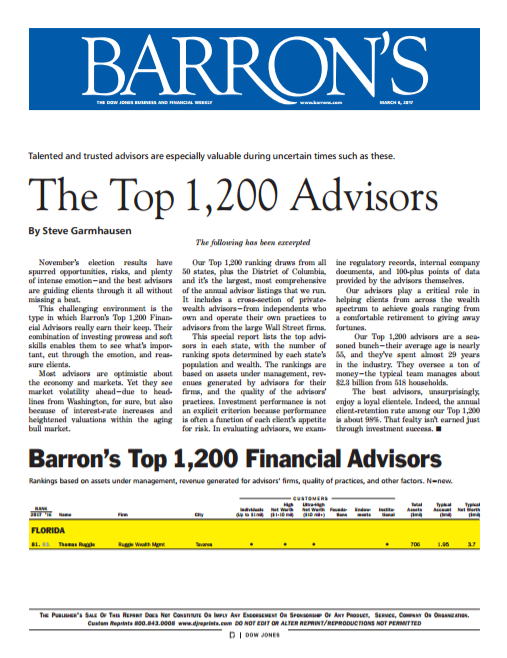 We’re honored to announce Tom has again been recognized for the fifth time among Barron’s Top 1,200 Financial Advisors and remains Lake, Sumter and Marion County’s only Barron’s recognized advisor. The ranking takes into consideration quality of practice, assets under management, revenues, and philanthropic work, and recognizes advisors demonstrating exceptional performance, professionalism, client service and community involvement. He has also been ranked among the Financial Times 300 Top Registered Investment Advisors in 2016 and 2017. Each year, the Financial Times—one of the world’s leading media organizations focused on international business and economic news—publishes a listing of the “300 Top Registered Investment Advisors”. Ruggie Wealth Management is honored to be included on the list for two years in a row. We thank you for your trust and ongoing support and look forward to many productive years of working together. Tom Ruggie’s keen insights into investment analysis and management have earned him prestigious industry recognition as a national expert on front-burner topics. 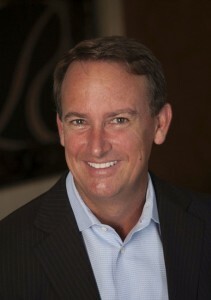 He has been invited to appear on national programs including CNBC’s “On The Money” and “Power Lunch”, PBS’ “Nightly Business Report”, on Fox Business News, and CNN Money, and has been quoted in important financial newspapers and magazines including the Wall Street Journal, New York Times, Forbes, Barron’s and US News and World Report. Five Star Professional is pleased to announce Thomas H. Ruggie, ChFC®, CFP®, Ruggie Wealth Management, has been chosen as a national Five Star Wealth Manager for 2014. Five Star Professional partnered with Orlando Magazine to recognize the local wealth managers from the Orlando area who provide quality services to their clients. Tom was featured in a special section of the May issue. The demand for independent wealth advisors who act in their clients’ best interest continues to increase. More and more people are telling us our business model, processes and exceptional service are exactly what they’re looking for, and we believe they’re what continue to earn us national attention,” said Ruggie. The Five Star Wealth Manager award program is the largest and most widely published award program in the financial services industry. The award is based on input from peers and firm leaders along with client retention rates, industry experience and a thorough regulatory history review. “Based on our evaluation, the wealth managers we recognize are committed to pursuing professional excellence and have a deep knowledge of their industry. They strive to provide exemplary care to the people they serve,” said Jim Olson, CEO, Five Star Professional. Thomas Ruggie was recently recognized by Dental Practice Management and Dental Products Report as a 2014 Best Advisor for Dental Practices. Candidates were selected to the list based upon client and peer references, strong recommendations from dentists, and knowledge and experience in the financial industry. Applicants were also required to complete a questionnaire listing credentials, educational background, noteworthy professional achievements, and specific areas of expertise. In 2013, for the second time, Florida-based Ruggie Wealth Management’s Tom Ruggie was named to Barron’s List of America’s Top 1000 Financial Advisors. This list includes both independent advisory firms and large wirehouses. 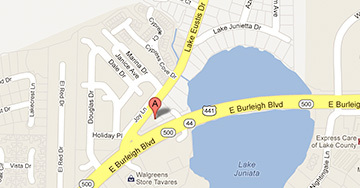 Tom was the only independent financial advisor chosen from the Central Florida area. Tom Ruggie was recently named among the 2013 Best Financial Advisers for Doctors by Medical Economics magazine. In addition, Ruggie was one of an elite group of advisers quoted in the accompanying article, answering the question, “Why do doctors need the help of financial planners?” Criteria for inclusion as a Best Financial Adviser for Doctors included a depth of knowledge about a broad range of financial issues, a focus on physician business or the medical field, provision of services to a broad geographic range, and good standing as evidenced by the national database of FINRA. In 2013, Tom Ruggie was chosen to attend the NASDAQ Opening Bell Ceremony in NYC’s Times Square. “We were privileged to host Tom at our NASDAQ Opening Bell ceremony in New York, where we were given the unique platform to showcase and celebrate the success of a number of our top advisors,” said John Moninger, Executive Vice President, Advisory and Brokerage Consulting Services for LPL Financial. 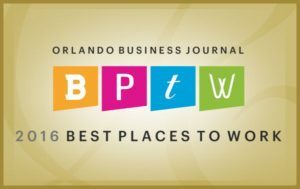 Ruggie Wealth Management, with offices in Tavares and Winter Haven, joined Central Florida’s elite financial advisor firms atop the Orlando Business Journal’s Top 100 list, in a year filled with numerous recognitions for the firm and its President Tom Ruggie. Following is an article which appeared in 2011 in the OBJ which featured Tom speaking on commodities as investment opportunities during that period of time. Investment opportunities in today’s market include commodities, municipal bonds, high-dividend-paying companies and firms in emerging markets. Tom Ruggie, president and CEO of Tavares-based Ruggie Wealth Management likes companies involved in infrastructure like heavy equipment maker Caterpillar Inc. (NYSE: CAT ), due to the massive rebuilding expected in Japan.